When the Ethernet interface of the coolcept inverter is connected to a router, the data from the data logger of the inverter is sent directly to the StecaGrid Portal. Setting up the portal is easy: Follow the link below to the system data entry mask. In addition to system output, the modules used and the location of the system, the serial numbers of the installed inverters are queried. On the StecaGrid Portal, up to 5 coolcept* and coolcept-x inverters can be combined to one system. 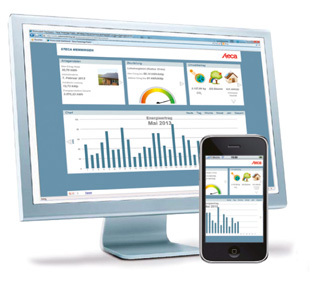 The data of the individual devices are added up and displayed as a complete system. 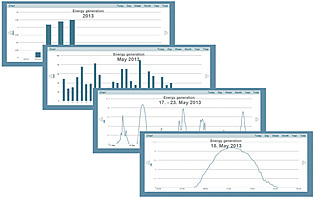 If the system operator agrees to having his system data published on www.solare-energiewende.de, the StecaGrid Portal (offered in collaboration with meteocontrol) can be used free of charge for two years. Afterwards for further optional use, which is not free of charge, he will receive an offer. The software interface is very clearly structured. 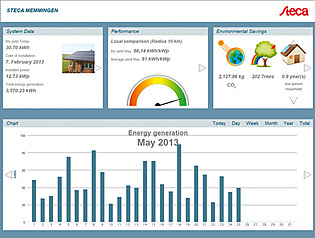 In addition to the system data, yield data is displayed in daily, weekly, monthly and annual profiles. A scale evaluates current yield data of the system in comparison to values from other systems in the same region. This allows the user to determine at a glance whether the system‘s yield lies above or below the regional average. The display also shows the user‘s environmental contribution in terms of CO2 saved due to yields. 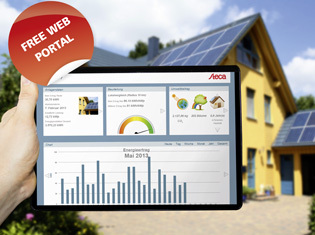 Monitor the output of your PV system for free with the StecaGrid Portal. With the intuitive user interface, you can access your yield data anywhere and at any time – even from your smartphone or tablet PC.